Nestlé is promoting Club dark chocolate with a computer generated television commercial with the tag line, “Stirs Something Deep Inside”. JWT Sydney worked with animation company Collider to link the strong flavour of dark chocolate with an arresting, unusual visual display featuring spike-like transformations and geometric contortions. 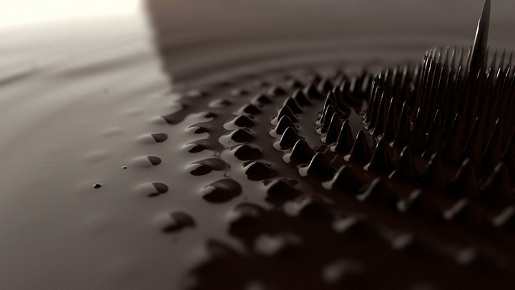 Molten dark chocolate appears to respond to deep sound waves, forming ridges and troughs with mathematical precision. The Nestle Club campaign was developed at JWT Sydney by executive creative director Andrew Fraser, associate creative director John Lam, senior copywriter Simon Armour, art director Blair Kimber, and agency producer Amanda Slatyer, group account director Peter Bosilovski and senior account director Fiona Tenaglia. Animation was directed by Andrew Van der Westhuyzen at Collider with producer Pat Dedal. Editor was Adam Wills. Music is by composer Matteo Zingales at Supersonic (now Sonar Music), Sydney.